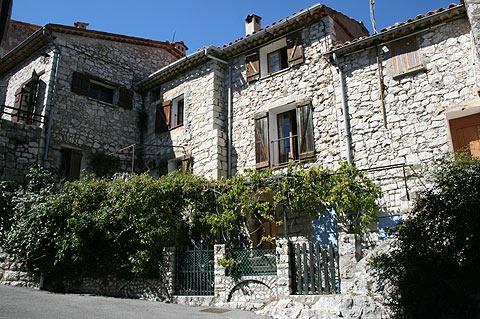 As you approach Gourdon on the road from the south, climbing ever higher through the rocky forested valley, you can't help but be impressed by your first view of the village. 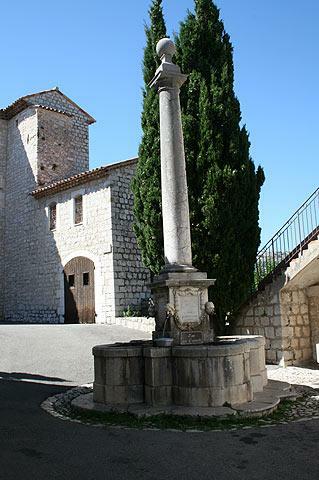 Gourdon sits high on top of a rocky promontory at an altitude of 760 metres, from where it has magnificent views over the valley of the Loup River and beyond to the Mediterranean, from Nice to Theoule - a long way! Gourdon really is one of the most stunning of the 'perched villages of Provence' and the main attraction of the village is the far-reaching views, which are ample reward for coping with the tourist crowds for a couple of hours. There is a viewpoint at the end of the village from where these are best appreciated. It is also known as the 'Eagle's Nest' because of this exalted position. France This Way comment: you should be aware that Gourdon is a very small village, little more than one short 'main street' and a couple of side-streets, and it is also a 'main stopping point' for a large number of the coaches that tour the region, so can be very busy. 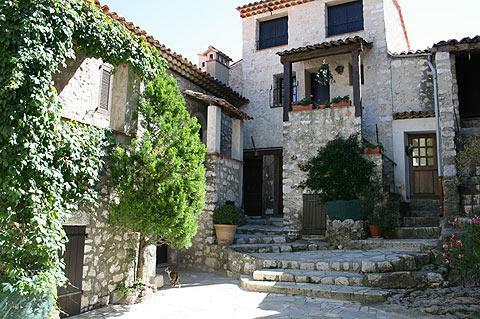 The village itself is of course very attractive and beautifully restored, and with medieval streets lined with beautiful old houses, artisan shops selling perfumes and crafts etc. The main historic highlight in Gourdon is the 9th century (rebuilt in the 16th century) Chateau de Gourdon, which includes a Museum of Decorative Arts, a Medieval Museum, and is surrounded by gardens designed by the renowned Andre le Notre. 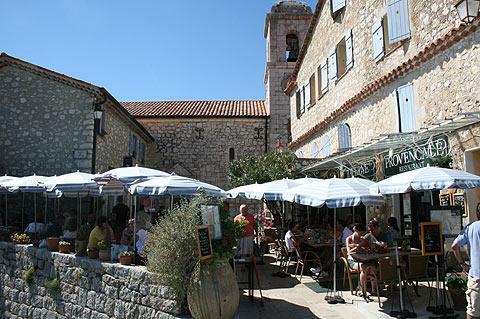 In Gourdon you get more sense perhaps of being in a tourist attraction than in a real village. 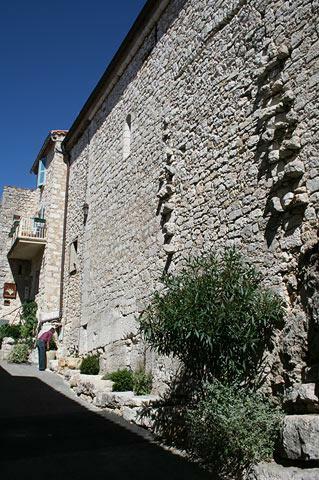 I would guess there are very few permanent residents in the village itself so Gourdon does miss that aspect of the charm of many of the Provencal villages. Of course I am not trying to deter you from visiting, in fact a visit is highly recommended, especially for the approach to the village and the castle and views in the village, but don't ONLY visit Gourdon! Just remember that there are other villages that have equally good views and a more authentic village feel to them in the region - although perhaps none that look quite so awesome as Gourdon does from across the valley! 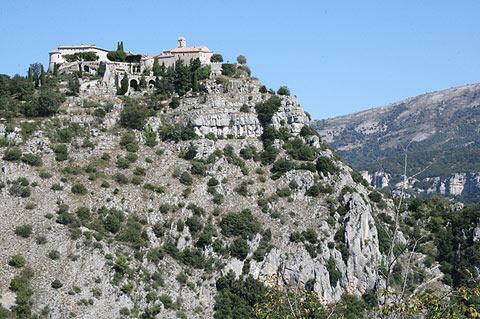 An alternative interesting way to reach Gourdon is by the old mule track from Bar-sur-Loup. 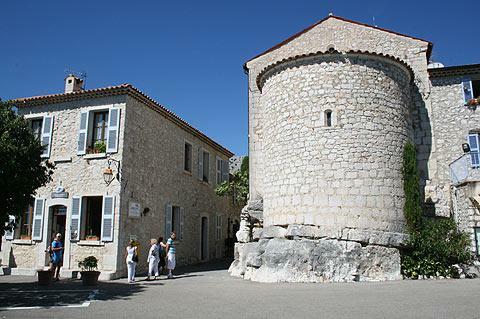 Of the many interesting towns and villages in the area and along the coast around Gourdon one we particularly recommend is Valbonne, in part because it gets less attention than we think it deserves!